As we had feared, our time in Dawson was quickly nearing its end. 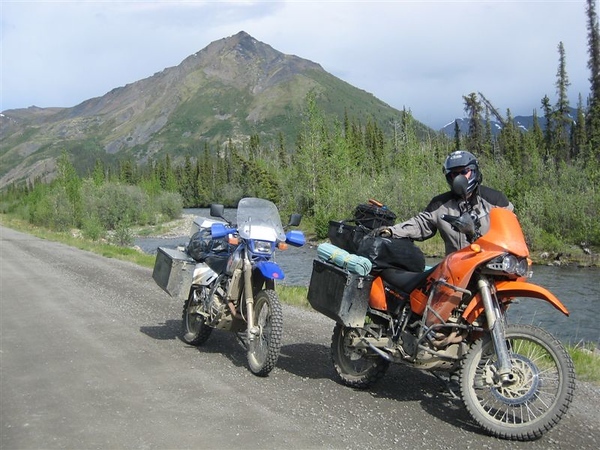 We had originally planned to ride the length of the Dempster Highway to Inuvik. But as our time waned, we knew we could not accommodate such a journey. Yet we were still determined to see more of the surrounding area and at the very least take a brief ride onto the famous Demptster Highway. It was an easy pavement ride to the Dempster in bright sunshine and our spirits rose even further just as did the fluffy clouds in the sparkling azure Alaskan sky. When we did reach the Dempster it was in marvelous condition. We had heard horror stories about how treacherous it could be with any amount of rain but we were indeed lucky as the road was hard and smooth and fairly dust free. If it weren’t for the spectacular scenery, in its present condition, the road was literally a gravel high speed highway. But we were in no rush and the sights were far to beautiful to speed by without taking notice. So we dawdled along admiring the towering mountains often covered with beautiful green trees of differing varieties and greenery too vast to describe. Although they were often very green, sometimes they were barren in places and the inner core of the mountain could be seen. Hard stone of differing colors, greys, pinks and blues appearing like the bones and sinew of the mountain made itself known . Without trying to, the underlayments told the story of the mountain’s life. Soft green trees and greenery supporting all manners of life existed at the surface, while just below, cold stone lay dormant holding the living above its head. Truly, “The Great Land” is a master showman; showing you how amazing the interlocking puzzle of nature is. Everything is connected. Everything. 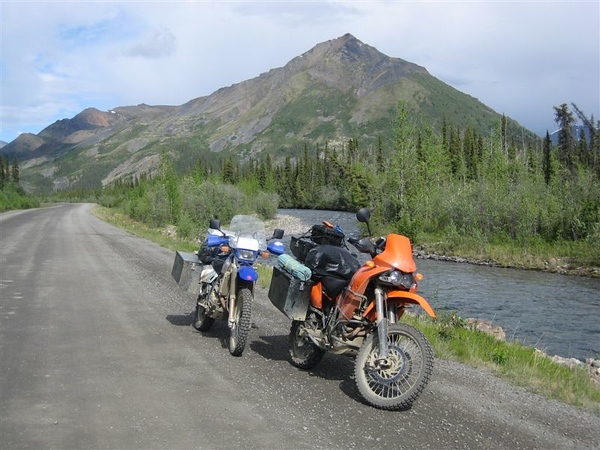 We rode about 60 miles up the Dempster and stopped to have a lunch by the side of the road. For some reason, our bag lunch tasted even better than usual in the beautiful surroundings. So after munching down a sandwich, some nuts and an oreo cookie or two, we decided it was time to turn back to Dawson. It was very strange, but travelling in the opposite direction was like taking another trip. It looked like different scenery. Were we sleeping on the way north? It was fantastic, a two way treat of a ride. We couldn’t explain it. The mountains were beautiful, the rivers that ran beside the road had a different character, everything seemed new. I felt like I was a kid at a carnival just getting off a ride and heading to the next. It was that kind of excitement. I was a bit drunk on it. I was having more fun than I could remember in a long time and my inner kid had just emerged. What a feeling. At one particular point we decided we just had to have a picture. So we pulled off to the side of the road near a small stream in front of a mountain. I got a pretty nice shot of the bikes with the mountain in the background. Then Kim said she wanted a picture with me in it. So off I went to get into the picture. We wear intercoms so we can talk to each other on the bikes and while Kim was lining up the shot, I asked her through the intercom “Kim, are you sure the bike’s mirror isn’t in front of my face?” “No, it’s ok” came the speedy reply and she took the picture. Another thing Kim likes to do is take a series of pictures of closer and closer zooms, and this series was no different. So as she focused for the second picture, I still thought my face might be covered by the bike’s mirror. “Are you sure that the mirror isn’t blocking my face?” “Yes, I’m sure”, came the reply and “click” went the camera. Finally, it was time for the third and final shot and I really thought the mirror was in the way of my face. Kim, really, are you sure the mirror is not blocking my face?” The only answer was the “click” of the camera. So when we reviewed the results of this little picture taking opportunity, this was the result. 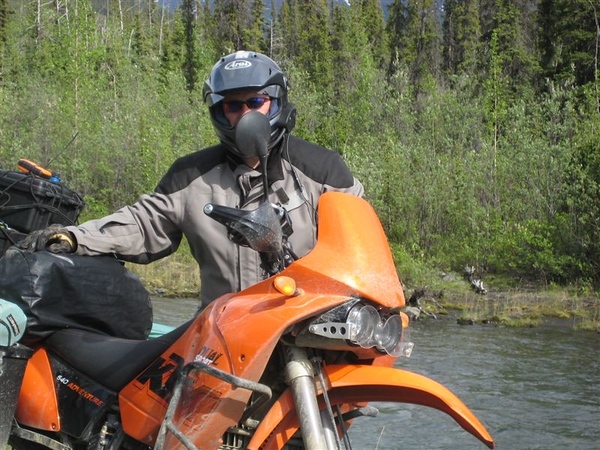 As we finished up the picture taking, another rider was riding his way north on a BMW F650GS towards Inuvik, our original destination. He stopped and we chatted about where he was headed and said that he was indeed headed to Inuvik which was about 400 miles away. I asked him if he had any extra fuel and he said that he did not. When I asked him when he had last filled up he said he wasn’t sure. Kim and I were astounded. Here we were in the Canadian Yukon, in significant bear country and this gentleman absolutely didn’t have enough fuel to get himself to Inuvik and he may not have had enough to get himself to the next town at Eagle Plains over 100 miles away. Since the bike I was riding carried 7 gallons of fuel I offered to give him some fuel. Luckily, he accepted and I was able to give him over 3 gallons of gas! That being the case, it would have been problematic for that gent to reach Eagle Plains. Boy were we glad we had this chance meeting. So feeling we had done our good deed for the day we headed back to Dawson City for dinner. We had promised ourselves a nice dinner at one of the premier restaurants in town. Oh boy was it nice. The presentation was marvelous and the taste wonderful. It was a splendid way to top off a beautiful day of riding. After dinner, we did a bit of walking around town to drink in all that Dawson City represented. With sunrises around 3:30 in the morning and sunset around 1:00, there was a lot of sun for the day. I for one, did not miss the night and could have stayed up for what seemed forever during our stay in the Dawson City area. As great as Dawson City is, there’s even more to be seen as we head back southeasterly towards McCarthy, Alaska which we’ll tell you about in Part 6. 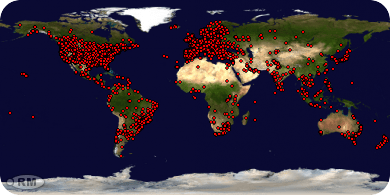 This entry was posted on April 16, 2012 by Ride2Adventure. 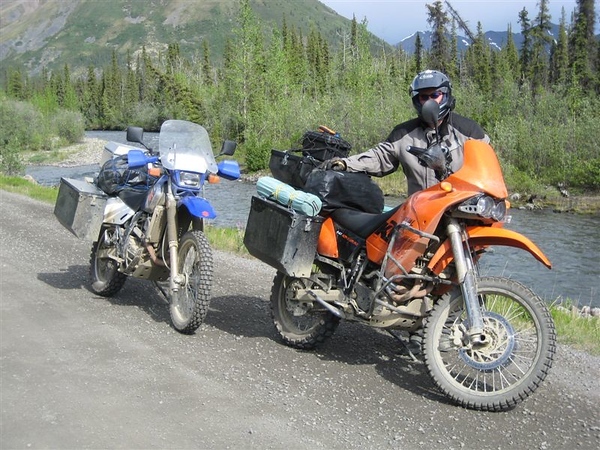 It was filed under Adventure, Adventure Motorcycling, Adventure Rides, Alaska, dual sport, enduro, Motorcycle, off road, Overland, rallye, Travel, Uncategorized, Yukon and was tagged with adventure, adventure bike, dual sport, enduro, kimike, motorcycle, off road, overland, ride report, ride2adv, ride2adventure, riders, travel. Nice blog!! If you have never heard the Album “Alaska” by Joanne & Monte, you really need to get it. The Great Land Symphony is one of my favorites and McCarthy is mentioned in it and much more.. But I may be biased as I was born in Alaska. Thanks so much for the props. Please come back anytime. We’ll check out the album right away. That man you encountered, I hope he realized how lucky he was to have met you guys and your concern and generosity to give him fuel. How can anyone travel in such country and be so unprepared and ignorant. You’re he best! Willy, we were happy to help, but it is a bit scary that someone would make such a trip so unprepared. Awesome adventure with terrific photos. Lovely post. Thanks Sartenada, we hope you come back again soon! Great post, that trip, on a bike is on my list. Thanks so much OurBoler. It is a great place, do make it a priority to get there if you can.